I finally got around to trying the Pondan Pandan Chiffon Cake Mix, which sells for $3.99, that I received from Asian Supermarket 365. I was debating whether to make a cake when lil' sis suggested I make mini cupcakes instead. We used store-bought white frosting. 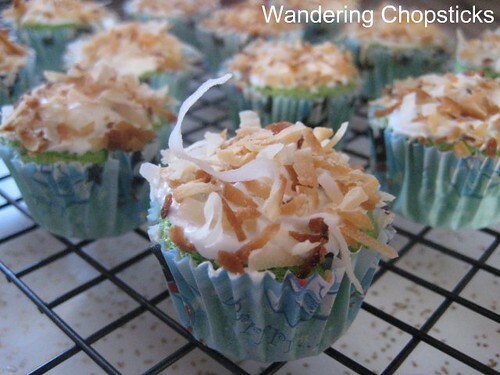 Lil' sis frosted them and sprinkled the toasted coconut flakes. Bite-sized goodness. 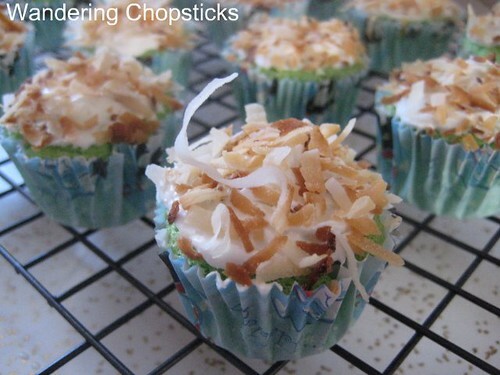 The coconut flakes nicely complemented the green flavor of the pandan. I was at a loss for descriptive phrases. How would you describe pandan? 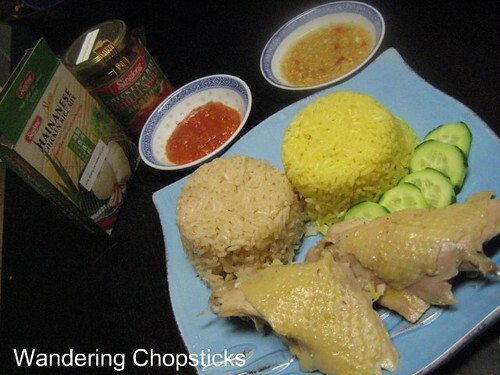 Other products that I liked were the Singlong Hainanese Chicken Rice Mix $2.99. The ingredients listed were sunflower oil, ginger, onion, garlic, chicken powder, salt, sugar. I was imagining chicken bouillon cubes but the mix turned out to be oily with lots of chopped garlic and ginger. I also served it with the Singlong Chicken 'n' Rice Chilli Sauce for $3.69. Now you know the only dish I'm a purist about is my family's com ga Hai Nam (Hainanese chicken rice). So for comparison, I made up a batch of chicken rice in the traditional method and cooked the packaged mix in the rice cooker. The mix is on the left and my homemade chicken rice is on the right. The rice is really yellow because I hadn't made com ga in a while so I was pretty heavy-handed with the turmeric. Jarred chili sauce on the left and Nuoc Mam Gung (Vietnamese Ginger Fish Sauce) on the right. The verdict? It's pretty good! I was actually very surprised. While it didn't taste quite the same, missing the delicate taste of rice that had been simmered in chicken broth, the oil, garlic, and ginger made it a very flavorful rice indeed. Lil' sis had her doubts and didn't want to try it at all. But I urged her to. The oldest '87 said she liked it too. And so lil' sis tried and was pleasantly surprised too. While we all preferred our family's homemade version, the Singlong Hainanese chicken rice mix was quite tasty by itself. I also tried the Hup Loong Tepung Goreng Belacan Chicken Powder, which I couldn't locate on the website anymore. The ingredients were beans powder, black pepper, toasted belacan powder, lemongrass, garlic, cinnamon, cardamon, and salt. The belacan reminded me of mam ruoc (Vietnamese shrimp paste), but slightly different. 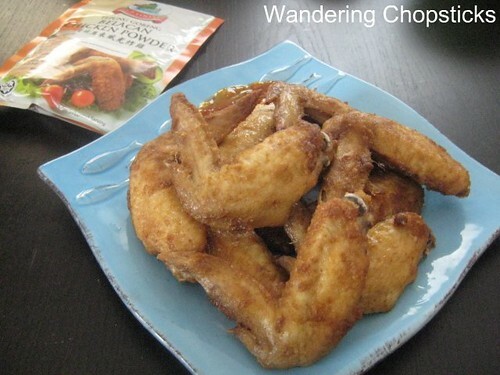 The wings fried up slightly crispy and infused with shrimp paste flavoring. It's hard to go wrong with fried chicken wings and I easily ate these up. After our visit to Thai Purple - Alhambra, lil' sis wanted curry, something she hardly ever craves. 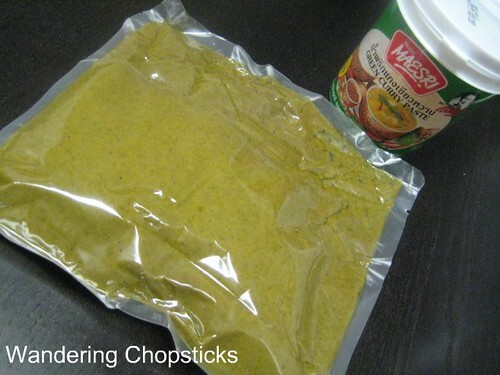 So I dug into my box again and turned up a container of Maesri Green Curry Paste for $3.59. The ingredients were listed by percentages: Chili 40%, Garlic 25%, Shallot 15%, Lemon Grass 6%, Salt 6%, Spices 5%, Galangal 3%. The curry paste came in a big sealed plastic bag. We used maybe a quarter of the bag, and I packaged up the rest into smaller bags and stored them in the freezer. Though it only said 3% galangal, I thought the galangal taste was very overpowering and didn't much care for it. I added in some tomatoes since that was the only other vegetable I had on hand. Lil' sis was happy as it was quick and easy to put together and completely satisfied her curry cravings. She liked it so much she took the rest of the frozen curry paste with her to school so she could make curry whenever she gets a craving. Me? Since I make my own Thai green curry, I much prefer my version. 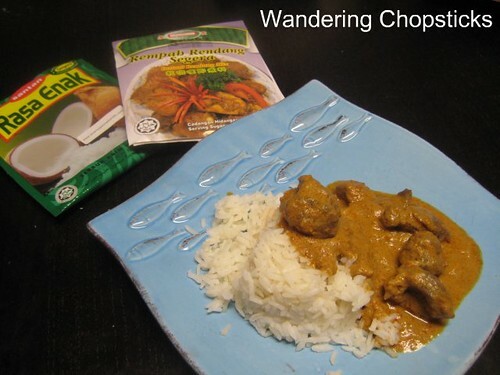 And lastly, when lil' sis yet again had a curry craving, we made ChanHong Rendang Mix for $1.99. These ingredients were: Chillies, Shallots, Lemon Grass, Galangal, Ginger, Salt, Seasoning, Palm Oil (Vegetable Oil) and Permitted Preservatives (E211). I don't really remember the taste, just that it wasn't as good as other beef rendangs that I've eaten. I really liked the Rasa Enak Coconut Milk Powder for $.99 though. It was incredibly creamy and fresh-tasting. If I could find it easily in the supermarket, I'd definitely go for this instead of my usual coconut powder. Another shot of the pandan mini cupcakes since lil' sis spent so much time decorating them. I brought these cupcakes to White on Rice Couple's dinner party. That's why I was late. So I guess it's only fitting that I'm also late in posting about it! Please refer back to my Terrible Twos post to see the other items I've tried from Asian Supermarket 365. I also added an asterisk to products that I've reviewed and really liked in case you were trying to decide what to purchase. 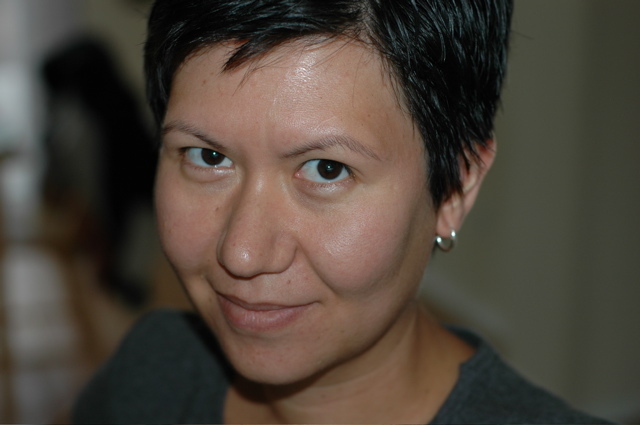 Ning of Heart and Hearth has nicely decided to give up her $10 voucher and let someone else use it. So here's the deal. I think the shipping costs will probably equal any savings you get with the voucher so you must be willing to actually purchase something and use the voucher. You must be located in the U.S., Canada, or Bermuda because of shipping restrictions. You must have previously commented on my blog at least more than once. That's it. First commenter who acknowledges that they meet all three requirements and actually says so in their comment, so that I know you've read the directions, wins the voucher. Congratulations! Make it spicy has claimed the voucher. Email me and I'll send you the code. 1 year ago today, roll your own pork patty rolls at Nem Nuong Khanh Hoa - Alhambra. Looks like your chicken rice (both versions) turned out better than mine. Maybe I should try Singlong, or just make from scratch? The rendang looked like chicken curry. It is supposed to be drier. pandan is hard to describe. I usually say it's like the SE Asian equivalent to sweet rose water used in Indian desserts. Slightly sweet, kinda floral. Of course, if someone hasn't tried rose water, they'd have no idea what I'm talking about. mortar stores), but the shipping cost was more than my order total! Egads. I only got 3 things, all of which you gave good reviews on. Was wary of getting more since I'm not sure if I like Indonesian food yet, but we'll see. Thanks! cant believe i missed this! None of the packets that u mentioned seem to be available in Aus yet. I will keep my eyes open! 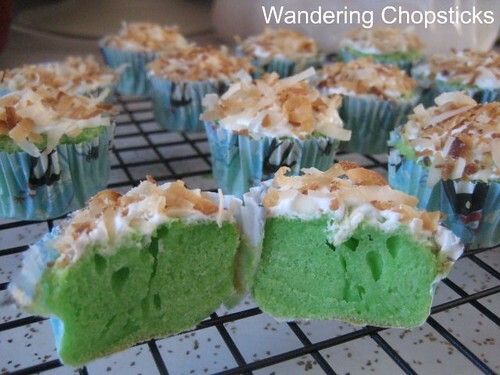 wow, what a great price for the pandan cupcake mix! The rest of the dishes look great too. 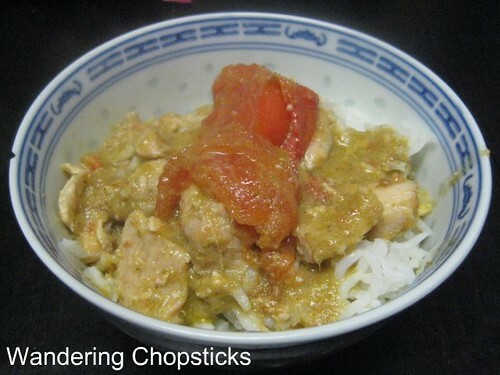 I lived off green & red curry paste (like your picture) when I was backpacking YEARS AGO. Those are the best! Thanks for the reminder, I'll have to go get some more. More power to great mixes like all these here, I love them all. Thanks for bringing the yummy cupcakes, those disappeared very quickly by the end of the evening! Beat everyone to the punch didja? Well, technically I didn't make a chiffon cake so who knows how it would have turned out. The mini cupcakes worked out great though. I'm horrible at describing flavors. Pandan in Vietnamese in la dua, I'm sure you've probably tasted it before and didn't know it. Most pandan desserts are artificially flavored actually. I know. I like mine with a bit more sauce so I added more. But the flavor wasn't as good as other versions I've had. I hope you like the stuff. I've enjoyed the majority of the products. Backpacking?! I'll have to ask you more about that experience. However do you eat curry on the road? wtheck! where was i when u made the chicken rice?? and those chicken wings look sooooooooo good!!! I don't know but cousin Q had some. 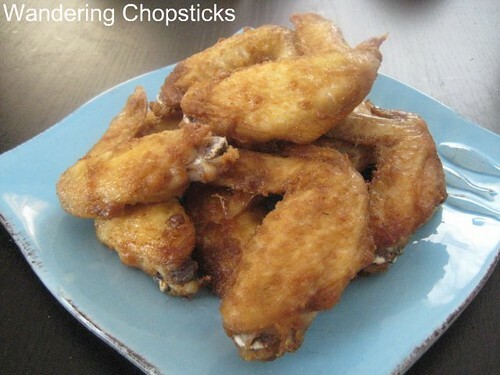 :) I still have half a packet of those chicken wings left so I can make them next time you're home.